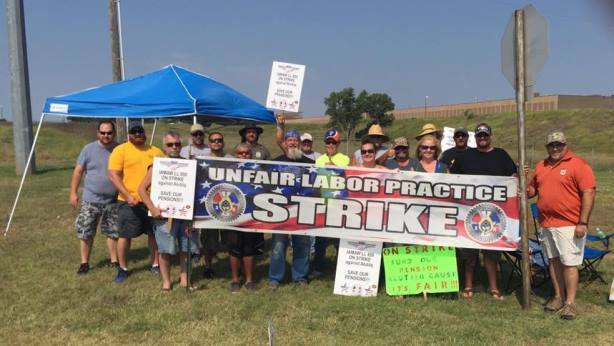 Well into the seventh week of its strike against Tinker Air Force Base service contractor Alutiiq Commercial Enterprises, more than 240 Oklahoma City IAM Local 850 civil engineering members remain united in their fight to protect their negotiated pensions. In a show of support during the 39th Grand Lodge Convention proceedings last week, IAM International President Bob Martinez and the IAM Executive Council committed $10,000 to the picketers and sent the convention flag to the strike line. Delegates from District 751, Local 751-F and District 160 raised an additional $3,016 to express their solidarity for the Oklahoma members. In a video message, District 171 Directing Business Representative Tony Bennett thanked the Executive Council and delegates for their financial and moral support. Alutiiq met with the IAM and a federal mediator late last month, but still refuses to contribute to the union pension plan which was negotiated into their collective bargaining agreement more than 16 years ago.